NEWINGTON - Two games ago on senior night against Windsor the Newington field hockey team moved defender Kelly Iskra to offense and it resulted in three goals and the second win of the season for the Indians. But Monday afternoon against Avon, there was no offensive production to be found on the field for the Indians as they lost their second straight game 7-0 against the Falcons. Avon was the dominant team on the field, running up and down ClemLemire Athletic Complex and featuring a dynamic offensive attack that had six different players score throughout the game. The Falcons scored three goals in the first half and were stronger in the second half, putting in four more. 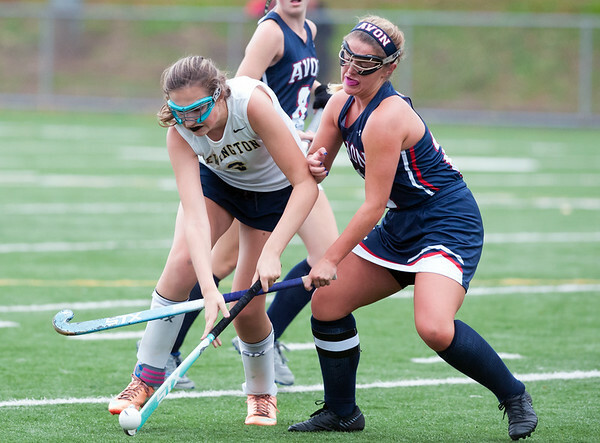 While the offensive struggles were worrisome, Newington head coach Victoria Grubin believes the team is still making fixes on that side of the field and that the offense will only improve as the season continues down the stretch. The defense for the Indians was stronger than the seven goals on the scoreboard would suggest. With Avon’s offensive attack swarming her all game, Indians goalie Sharon Sherpa made 12 saves and without her performance in goal, the seven-goal deficit could have been much worse. While the pressure isn’t something any goalie wants to deal with, Sherpa didn’t let that deter her from the type of game she likes to play. Six different players scored for the Falcons, who dominated possession throughout the entire game. Avon got goals from Ava Calma, Kayla Case, Megan Gilbey, Jamie Bubenstein, Sarah Thomas and two from Paige Deppe. Thomas and Lillian Satlof had assists in the game for the Falcons. The talent level of the Falcons was no secret to anybody watching. With the offense holding possession, it meant strong defense as well. The limited offensive opportunities the Indians had came on bad shot attempts, just trying to get any sort of pressure on the Falcons goalie Kathryn Pringle. Although the chances for the Indians were limited, they had a couple chances that had the look of a strong possession before Avon’s defense got its chance to shine as well. Early in the second half, Newington’s McKenna DeLuca came up with a steal and ran all the way down the field but her opportunity just came up short as Avon’s defense took the ball back from DeLuca. Kathryn Damato also had some strong possessions for Newington in the game but Avon’s ability to take the ball away and transition into an offensive attack was too much for the Indians. With the loss Newington fell to 2-6-1 on the season and will be travelling to take on Simsbury on Wednesday afternoon at 5:15 p.m. The Falcons moved to 7-1 on the season with the win. Posted in Newington Town Crier, Newington on Monday, 15 October 2018 20:35. Updated: Monday, 15 October 2018 21:22.